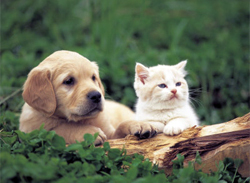 Shop for dental hygiene products your pets at VetDepot.com. Dental disease is the most common health problem facing dogs and cats today.1 By some estimates, 85% of pets over the age of four already have permanent, degenerative changes to their gums – a condition known as periodontal disease. 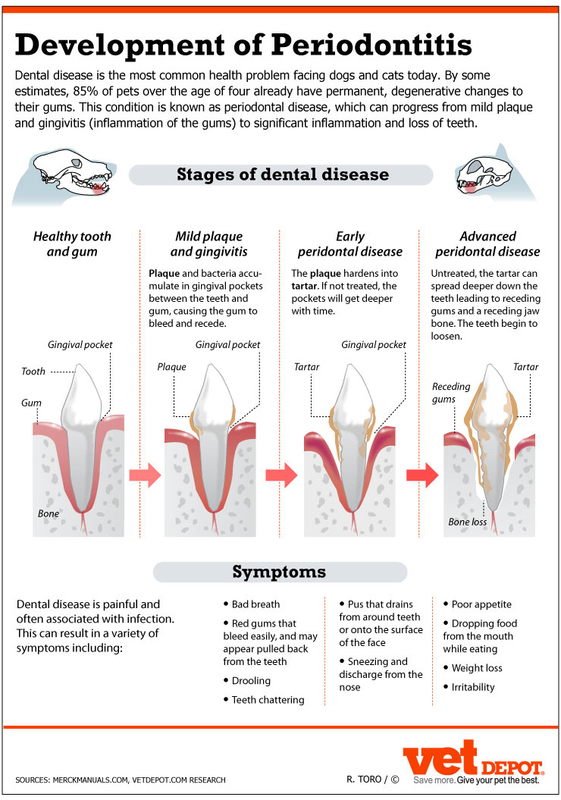 Even more prevalent than periodontal disease is the gum disease gingivitis, which is caused by the accumulation of plaque and tartar on teeth. Plaque is a sticky combination of glycoproteins found in saliva, bacteria, and the sugars they secrete. Over time, calcium salts in saliva mineralize the plaque into tartar, an extremely hard material that can only be removed with specialized dental instruments. The bacteria living in plaque and tartar secrete toxins that irritate and inflame nearby gum tissue producing gingivitis. At this point, a pet’s dental disease is still completely reversible if a dental prophylaxis (cleaning) is performed in a timely manner. When the condition is left untreated, however, plaque and tartar continue to accumulate and gingivitis worsens to the point where the gums begin to detach from the teeth. This is the beginnings of periodontal disease. The deep pockets that develop over time are the perfect location for more plaque and tartar to form. The inflammation that results can eventually destroy the ligaments and bone that hold teeth in place. Teeth loosen and may eventually fall out. Dogs and cats also get other types of dental disease that are not connected to plaque and tartar. Pets may break teeth as a result of trauma (e.g., chewing on bone). Bacteria in the mouth can then enter the inner part of the tooth called the pulp cavity, travel to the tip of the root, and form an abscess that may rupture and drain on the surface of the face. Cats are especially prone to developing large, painful holes in one or more teeth. The cause of the condition has not yet been determined, but it goes by many names including tooth resorption, neck lesions, cervical line lesions, and feline odontoclastic resorption lesions (FORLS). In advanced cases, affected teeth essentially dissolve until only a bump under the gum is left. As long as it is safe to do so, owners can get a general idea of a pet’s oral health by examining the outer surfaces of his or her teeth. Tartar is a hard, brown to orange substance that is typically stuck to teeth near the gum line. Gingivitis appears as a red line at the edge of the gums. To get a complete picture of a pet’s oral health, however, a veterinarian needs to examine the mouth while a pet is under anesthesia. When the need for a prophylaxis is obvious, the full exam, dental x-rays to assess the health of tooth roots and associated structures, and any additional treatments that are required can usually be performed at the same time as the cleaning. "Brushing a pet’s teeth every day, or every other day at a minimum, is best way to prevent plaque, tartar, gingivitis, and periodontal disease." A dental prophylaxis involves removing plaque and tartar from all tooth surfaces, including from under the gum line. Dental forceps, hand scrapers, and ultrasonic scalers may all be used depending on the severity of a pet’s condition. Once the teeth are clean, they are polished and a product called OraVet may be applied to help prevent plaque from quickly redeveloping. Fluoride may also be used strengthen tooth enamel. Brushing a pet’s teeth every day, or every other day at a minimum, is best way to prevent plaque, tartar, gingivitis, and periodontal disease. Use toothpaste designed for pets (e.g., CET enzymatic toothpaste) and apply it to the outer surfaces of the teeth with a soft bristle tooth brush, finger brush, piece of gauze, or small washcloth. Most pets can learn to accept tooth brushing if they are introduced to it slowly, ideally when they are young. 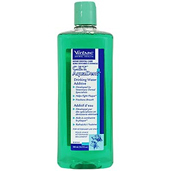 If tooth brushing isn’t possible, oral rinses (e.g., MaxiGuard Oral Cleansing Spray or CET Oral Hygiene Rinse), dental wipes (e.g., DentAcetic Wipes) or drinking water additives (e.g., Biotene or Petrodex) can all be used to good effect. Some types of dog and cat foods have even been specifically formulated to help remove plaque from pets’ teeth. The Veterinary Oral Health Council (VOHC)1 provides a list of products that have been proven to slow the formation of tartar and/or plaque. Tooth brushing and other types of home care will reduce the frequency of but not eliminate the need for periodic dental cleanings. Regular veterinary check-ups allow dental disease to be caught early and treated before it progresses to the point where adverse health effects are inevitable. 3. Association of periodontal disease and histologic lesions in multiple organs from 45 dogs. DeBowes LJ, Mosier D, Logan E, Harvey CE, Lowry S, Richardson DC. J Vet Dent. 1996 Jun;13(2):57-60.